LONDON--(BUSINESS WIRE)--The global sports and energy drinks market is expected to post a CAGR of over 11% during the period 2018-2022, according to the latest market research report by Technavio. This market research report on the global sports and energy drinks market 2018-2022 also provides an analysis of the most important trends expected to impact the market outlook during the forecast period. Technavio classifies an emerging trend as a major factor that has the potential to significantly impact the market and contribute to its growth or decline. 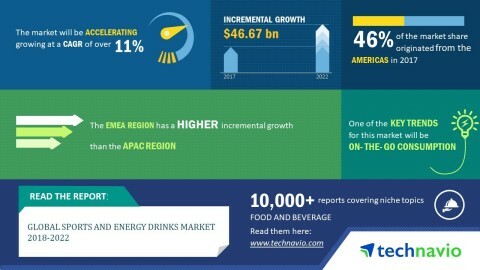 The global sports and energy drinks market is set to post a CAGR of over 11% during 2018-2022, according to the latest research from Technavio.